My favorite times to conjure always fall within some type of liminal space such as dusk, cloudy/rainy days where the sun is still peeking out, and eclipses. 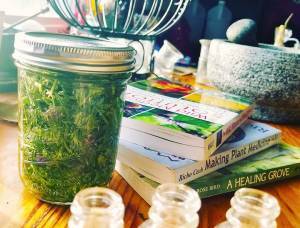 I have been working very hard to re-connect with the more magickal esoteric aspects of preparing plant remedies because it is a healing and grounding experience for me. As the sun was setting over the mountainside, I anointed my hands with hyssop and rose oil and focused on reveling in the company of the giddy plant spirits whirling around the jar of vervain bitters I was spellcasting. Yesterday was a good day.